London Blackfriars Has World’s Largest Solar Bridge, Generating Enough Power To Give Away 79,000 Free Cups of Tea On Its Launch Day! ! Today’s post is dedicated to my dear father, who had spent more than fifty years of his life as a civil structure engineer, designing and building bridges (he loved designing & building bridges so much that we even buried him in a boulder next to a bridge). He would have loved this piece! 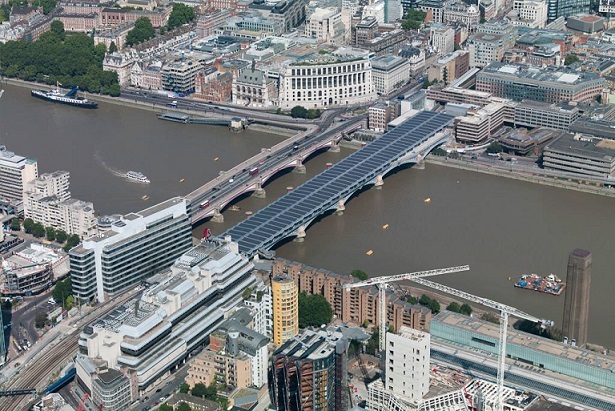 Wow, did you know that solar power generated at Blackfriars (Solar) Bridge produces enough electricity to make 79,000 cups of tea each day or to power 333 houses all year round? It’s able to meet 50% of the station’s electricity needs, such that this portion of the electricity demands are met by 4,400 solar panels covering the 6,000 sq meters (equivalent to 23 tennis courts) of the new station. Blackfriars Bridge 1.1 MWp solar system will be able to generate 900,000 kWh annually and saving 513,000 kg of CO2 annually.Not only has Blackfriars Bridge demonstrated to us that there is much of the surface areas of planet earth not yet fully utilized to generate solar power, but also the fact that by having the coverage for bridges, potentially this will help to reduce the amount of auto accidents and impact of wear and tare on vehicles during snow and rain seasons. There have been two structures with the name. The first bridge was opened in 1864 and was designed by Joseph Cubitt for the London, Chatham and Dover Railway. Massive abutments at each end carried the railway’s insignia, preserved and restored on the south side. Following the formation of the Southern Railway in 1924, inter-city and continental services were concentrated on Waterloo, and St Paul’s Station became a local and suburban stop. For this reason, the use of the original bridge gradually declined. 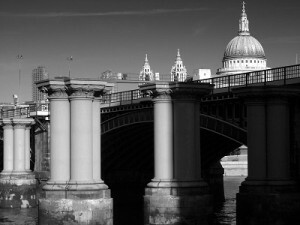 It eventually became too weak to support modern trains, and was therefore removed in 1985 – all that remains is a series of columns crossing the Thames and the southern abutment, which is a Grade II listed structure.The second bridge, built slightly further downstream (to the east), was originally called St Paul’s Railway Bridge and opened in 1886. It was designed by John Wolfe-Barry and Henry Marc Bruneland is made of wrought iron. It was built by Lucas & Aird. When St Paul’s railway station changed its name to Blackfriars in 1937 the bridge changed its name as well. At the southern end of the bridge was Blackfriars Bridge railway station which opened in 1864 before closing to passengers in 1885 following the opening of what is today the main Blackfriars station. Blackfriars Bridge railway station continued as a goods stop until 1964 when it was completely demolished, and much of it redeveloped into offices. 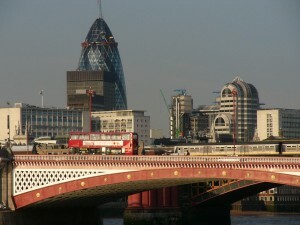 As part of the Thameslink Programme, the platforms at Blackfriars station have been extended across the Thames and partially supported by the 1864 bridge piers. The project is designed by Jacobs and Tony Gee & Partners and built by Balfour Beatty. The work also includes the installation of a roof covered with photovoltiac solar panels. It is the largest of only two solar bridges in the world (the other being Kurilpa Bridge in Australia). Other green improvements include sun pipes and systems to collect rain water . Let’s hope there will be more solar bridges throughout planet Earth in decades to come. This entry was posted on Monday, February 3rd, 2014 at 8:28 PM	and is filed under Editorial, Events. You can follow any responses to this entry through the RSS 2.0 feed. You can leave a response, or trackback from your own site.